Our herbal teas are made only with organic herbs and spices ensuring the purest quality and taste and have the soil association seal of approval. Herbs and spices contain active botanical ingredients, including flavanoids, sterols, anti-oxidants, vitamins, minerals and volatile oils all of which support our healthy function. We choose organic to protect our eco-system, and to create a more mindful and sustainable approach for both plants and farmers. We use Fair Wild ingredients where possible. A delicious blend of warming and comforting 'Super Spices'. These spices have long been treasured for their health-giving properties. 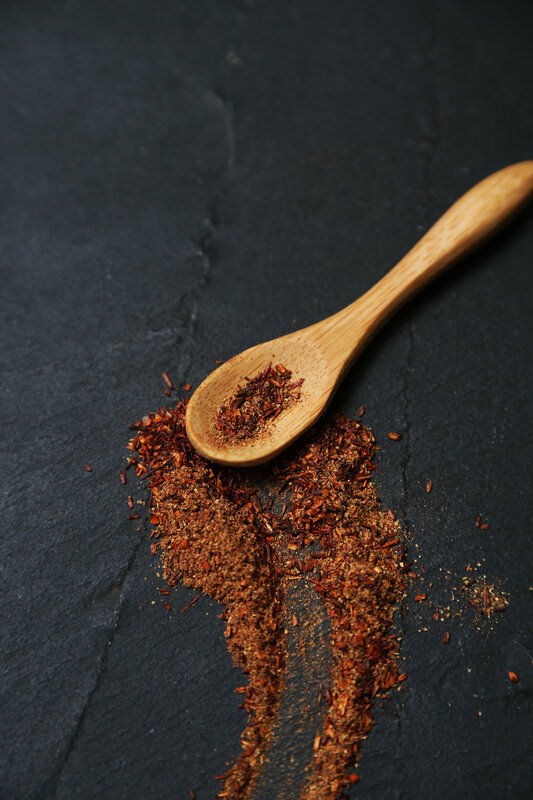 Super spice blend can be added to hot chocolate, smoothies, sprinkled onto cereal, porridge or pancakes. Our Delicious Restorative tea delights and lifts the senses and replenishes a feeling of restoration and balance. A beautiful blend of earthy Nettle, sweet nourishing liquorice root and fresh zingy peppermint. Delicious, warming and comforting our super spice tea is a delicate spicy caffeine free tea with ginger, black pepper, cinnamon, clove and cardamom blended with the finest anti-oxidant rich rooibos. Slow down, stop, take time out from your busy routine, time just for you. Find somewhere comfortable to sit for a few moments. Connect to how you are feeling right now. Take some slow, deep, full breaths, gently breathing into your tummy, your hara, your centre. Allow your breath to move upwards from your tummy and into your chest, feel your chest expand. Visualise your breath moving upwards through your neck and into your head and crown. Allow your breath to release slowly and smoothly. Invite a sense of letting go as you breath out, letting go of any tightness or tension, any holding, or thoughts that may be circulating, allow all of this to release with your out breath. Letting go of the old, all that has taken place before this moment, all that no longer serves you. Letting go with your out breath and inviting the new with your in breath, your vital healing breath, allow this breath and renewed energy to circulate throughout your whole being. Be aware of how you feel right now, do you feel different, improved, better than when you began? Listen to what your body is communicating to you, what do you need? Which tea are you most drawn to? Once you have selected your tea, take time to enjoy each stage of making your nutrient rich and delicious tea, be mindful, immerse yourself in the moment, and moment to moment, focus your awareness completely on your tea ritual, your tea ritual becomes your meditation. When your mind begins to wander, gently bring yourself back to your ritual, breathing deeply, see your thoughts like clouds as they come and go, do not hold onto them, or attach to them, observe and allow them to drift on by. Always honour yourself with compassion, kindness and love. No judgements. Know that your tea is a gift from nature, supporting your health and wellbeing, providing you with an opportunity to stop, reflect and connect. When your tea is ready to enjoy, drink mindfully, experience the aroma, what does it evoke for you? Taste the flavours in your mouth. As you drink your tea, how do you feel?